It’s every groom’s nightmare: the blushing bride getting to the big day and letting off both barrels against anyone who dares make her perfect wedding go off with the slightest hitch. Everyone’s heard of a bride who controls everything down to the minutest detail and spends days, weeks, months, agonizing over the direction in which the flowers are facing at the top table, and it’s this phenomenon that has inspired Microgaming’s video slot, Bridezilla. A 5 reel slot with Microgaming’s signature 243-ways-to-win system in place, the game takes a playful look at a modern stressful wedding, complete with some comic graphics, amusing animations, and interesting feature games. The customary put-upon groom (looking very nervous indeed) is one of the key symbols on the reels here, along with the bridal car (complete with ‘Just Married’ sign on the back), the church, the wedding cake, the bridesmaids’ bouquet, and the customary 10-through-Ace symbols. The Bride herself is Wild, and she substitutes in all her innocent looks for the regular symbols other than the Scatter. 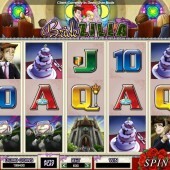 Wild wins are multiplied by the ‘Bridezilla Multiplier’, here anything from 1 to 10x. You should look out for the ringing bells, however, as this Scatter awards 10-20 free spins when three or more hit the reels in any position. Furthermore, five bells awards a massive 240,000-coin jackpot. If the bells are ringing out on wedding day, you’ll definitely be in the money. If a maximum of 20 free spins doesn’t sound like exactly your idea of a special day, wait till you see what Microgaming have thrown in to accompany them. 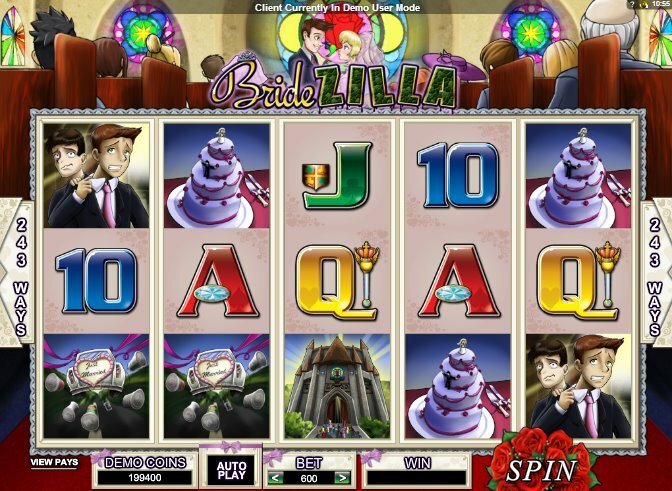 During the free spins round, Bridezilla will “rage” at random at the top of the screen, ‘raging on’ the highest paying symbol on the screen at that time to award big bonuses. For example, Cake symbols pay out a 2x bet win, while the groom awards a free spin if raged on. It’s a neat twist to the bonus feature round, and you’ll be praying she’s pissed off whenever you hit the feature so that she can turn some of that anger into cash wins. Microgaming have taken a light-hearted look at weddings, and while the clichéd view of brides may be a little suspect, there’s certainly a laugh or two to be had. Romance slots are always popular, of course, so make sure to check out one or two more traditional love-themed slots like Rival Gaming’s Wacky Wedding or another of Microgaming’s 243-ways romantic slots, Starlight Kiss.